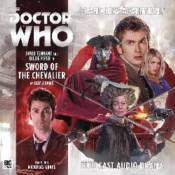 Starring David Tennant as the tenth Doctor with Billie Piper as Rose and Nickolas Grace as the Chevalier d'Eon. In 1791, the Doctor and Rose get to meet one of the most enigmatic, thrilling and important people in history: The Chevalier d'Eon. She used to be known as a spy, but then she used to be known as a lot of things. If there's one thing the Doctor knows its that identity is what you make it. Choose a life for yourself and be proud. Mind you, if the Consortium of the Obsidian Asp get their way, all lives may soon be over!